There's nothing better than playing a game of Scrabble, feeling the smooth wooden tiles in your hand and savoring the heavy fumes of cardboard, cheap wood and plastic as you rearrange the letters on your rack into the perfect word. You try to keep a straight face while you watch your opponent sweat, but you can't help but release that diabolical grin of self-admiration as you play the elusive triple-triple. The score's recorded and you feel sorry for your bitter rival, but then you remember you're not there to lose, you're there to win, and most importantly—to have fun. It's nearly impossible these days to have a game of Scrabble like that, because everyone's lives are so busy and getting together in person is a constant challenge. But that's okay, because almost everyone has a computer or a mobile device now, which means you can still get your Scrabble fix, only it's online and not in person. Playing online Scrabble isn't as fun as battling it out in the flesh, but it's addicting nonetheless. It's instant gratification. You no longer have to wait for that continuous hour-long sitting, because you can play any time you want—with as many people as you want. For the obsessed Scrabbler, it's a dream come true. Plus it keeps your word wits strong so that your in-person skills won't diminish over time. But where do you play Scrabble online? Below are my three favorite places. I'm not a big fan of games on Facebook, but if you want to play Scrabble against your friends, this is the easiest and fastest way to do it. Hasbro's online version of Scrabble (developed by EA) is great because you don't have to stick to playing on Facebook, but you can connect your games using the mobile apps for iPhone and Android. My only grievance is that it's too easy. It has a dictionary in each game, so players can see if their words are actually words or not, which I guess doesn't really matter since you can place fake words down on the board without it counting against you anyway. There is no way to challenge your opponent, which should be an added option. And the 'teacher' feature is available for your opponent to help them out, which I'm not a big fan of. Still, it's the best way to play online, though Words with Friends has a Facebook version now, which actually runs smoother than Scrabble—on the Web and on mobile devices. If you live outside of North America, you'll be playing the Scrabble Worldwide edition on Facebook instead. If you want to play Scrabble with your friends, but you don't want to kill the competitive nature of the game, then Pogo is the place to go. 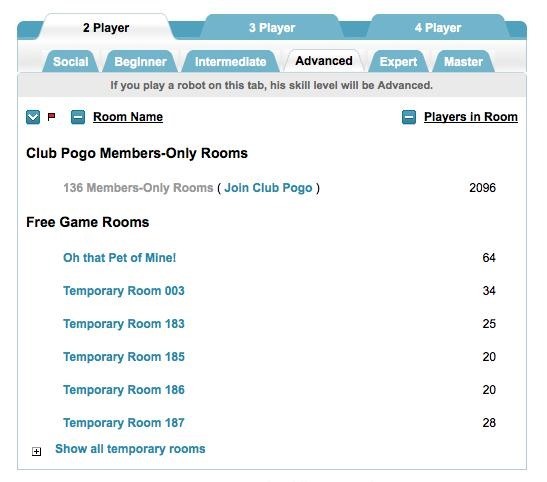 Once you create a Pogo.com account, you can play a quick game against a random opponent or test your skills against the computer. The gameplay is pretty much the same as the Facebook version, aside from a time limit, but it doesn't stop there. You can play games using the traditional rules of Scrabble, where whatever word you play stays, meaning there's no turning back because your opponent can challenge you if he/she wants to. Even better—you can play tournament style games bound by the rules of the NSA. You can even customize your gameplay options if you want. Plus there are tons of people to play against, in many different rooms. If you're willing to become a Club Pogo member by forking out forty bucks a year, then you can satisfy your ego by checking out your progress with the Club Pogo rank and badge system. You can also get a NSA rating to compare yourself against the pros. Pogo.com usually has deals on memberships, so it could be worth the money if you want the competitive experience. If you don't want to sign up for Pogo's website at all, free or paid, you can still play a quick game of Scrabble as a guest by clicking here. The next rung up the competitive ladder of online Scrabble is ISC, which stands for the Internet Scrabble Club. It's a really great place to play a tournament style game against some really talented Scrabblers. It's not as pretty as the above two options, but it's got the best group of players. In order to start playing on ISC, you need to register your name on their website and choose your handle. Then you need to download the WordBiz program, which you can get for either Windows, Mac or Linux. Once you start playing, you can choose which language you want, either English, French, Romanian, Italian or Dutch. As you keep playing you get a NSA rating and can compete against players of similar strength. To get the full grasp of what can be done, visit the ISC introduction page. 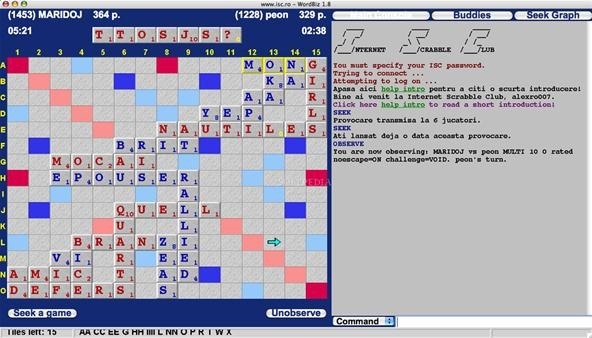 The three sites above are the best places to play Scrabble online, but there are other ones that are just as fun, like Quadplex and the email-based Pixie Pit Scrabble. If you have a hankering for gambling, I'd suggest playing Scrabble Cubes on Worldwinner. If you know of any more great ways to play Scrabble online, let me know in the comments below. Informative website. What has happened to the excellent Scrabble Worldwide on FB is was fantastic I had played over 1300 games and made a number of scrabble friends? Regarding Worldwide Scrabble on facebook. I also miss my regular scrabble friends from around the world I played with everyday. Facebook had been advertising they were upgrading the game, but instead I have been redirected to inferior US version, which is frustrating as it gives constant error messages and needs to refreshed, most times I make a word. It's not user friendly like the worldwide version was, it is sluggish, and does not use proper English spelling. The worldwide version was so much better. Please bring it back. Might I suggest http://wordgrid.com ? It's played with 8 letters, a bigger grid, and is played is Duplicate mode as everyone competes with the same letters. Which app allows me to play with the person sitting next to me ? If you want to play with the person next to you, I'd suggest using the Scrabble mobile app on your phone or tablet. It has a "Pass N' Play" feature that you can select from the "Create New Game" option. That way you can't see your opponents tiles and they can't see yours. How can a person in the United States play a friend in the UK? All of the apps we have found are for one country or the other but not both. I developed an application for iPad and iPhone that didn't exist yet and that allows you to practice Scrabble and similar games in an addictive way. The application allows you to play Scrabble, Word With Friends and Wordfeud (Lexulous will be supported in the next update) in Duplicate mode. It also has a powerful anagrammer. You can save the games or send them by email in csv format. 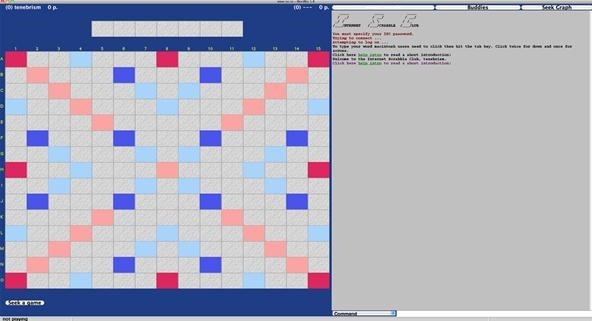 The next update will offer the possibility of entering a real game to analyse the moves a posteriori. The application supports English, French, Spanish and German dictionaries. The basic version is free of charge. ISC is antiquated and I've run into the rudest players there. 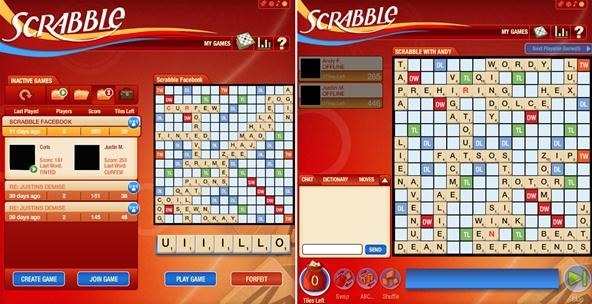 A few years back, a couple of brothers in India designed the quintessential online scrabble game. Unfortunately Hasbro sued and it is no more. They can now be found at Lexulous.